Lace up and join us out on the ice this season to participate in ASRAB’s blind hockey program with our local team, the Edmonton See Hawks! 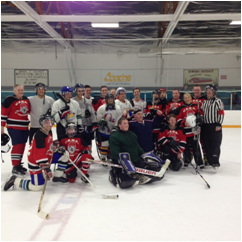 Blind hockey in Edmonton is played with both visually impaired and sighted players (for support) on the same team. This program is best suited to anyone ages 13 and up who have some experience skating. Full hockey equipment is required. Sharpen up your skates and join the Edmonton See Hawks this season! Date: Our first practice will be Sunday November 22, 2015 at the Kenilworth Arena ( 8313 68A street) from 8:45-9:45pm.